Since a stellar performance at Madison Square Garden back in late November, senior goaltender Michael Lackey has found a new level of confidence and sturdiness between the pipes. The Harvard men’s hockey team’s starting goaltender, Michael Lackey, did not have the chance to field pucks from Quinnipiac when the Bobcats came to Cambridge in early November. 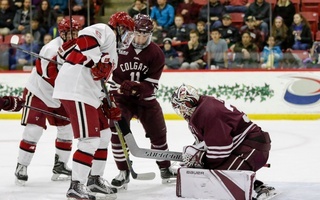 After a porous performance (7 GA, .741 SV%) in the Crimson’s season-opener at Dartmouth, coach Ted Donato ’91 opted for backup Cameron Gornet when his team hosted Quinnipiac the following weekend. Flash forward to Saturday night, however, and Lackey (1 GA, .979 SV%) was the difference-maker for his squad in its 2-1 victory over the No. 6 Bobcats (16-5-1, 7-4-1 ECAC). 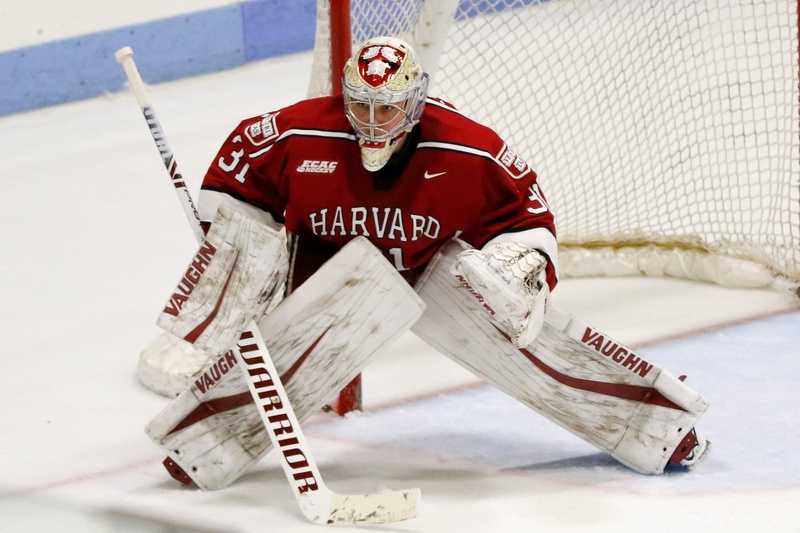 His 46 saves powered Harvard (7-5-3, 4-4-3) to its most crucial triumph of the campaign. Lackey was 30 seconds from logging his second career shutout before the Bobcats broke through with their goalie pulled. Freshman forward Ethan De Jong forced the puck past the then-perfect senior after picking up a rebound from fellow rookie Wyatt Bongiovanni’s wrap-around attempt. While the home team controlled possession for much of the game, Lackey exuded confidence between the pipes while making big-time saves to keep the Crimson ahead. Throughout the season, the backstop has shown progress on both fronts and, with only a few exceptions, has answered coach Donato’s challenge to seize the starting role. In both of their games this weekend, the Bobcats conceded the first goal. Similarly, Harvard struck first in both of its contests. With the Crimson’s second powerplay opportunity of the night waning, junior defenseman John Marino rocketed a one-timer from the right point past Quinnipiac net-minder Andrew Shortridge. Marino’s blast was his first of the season. Junior defenseman John Marino found twine for the first time this season to open the scoring in Saturday night's ECAC bout. The tally on the man advantage continues multiple trends for the Harvard squad. The Crimson powerplay has found twine in all but three contests in 2018-2019 and has done so in its last three tilts. The primary facilitator on the nation’s top man-up unit (35.7%) is junior blue-liner Adam Fox, whose 1.53 points per game and 1.07 assists per game pace all collegiate defensemen. Fox teed up Marino’s one-timer, earning the primary assist on the snipe. In doing so, he extended his small point streak to three games — one which he must rebuild after a dry spell of equal length ended his nine-game scoring spurt that opened the campaign. 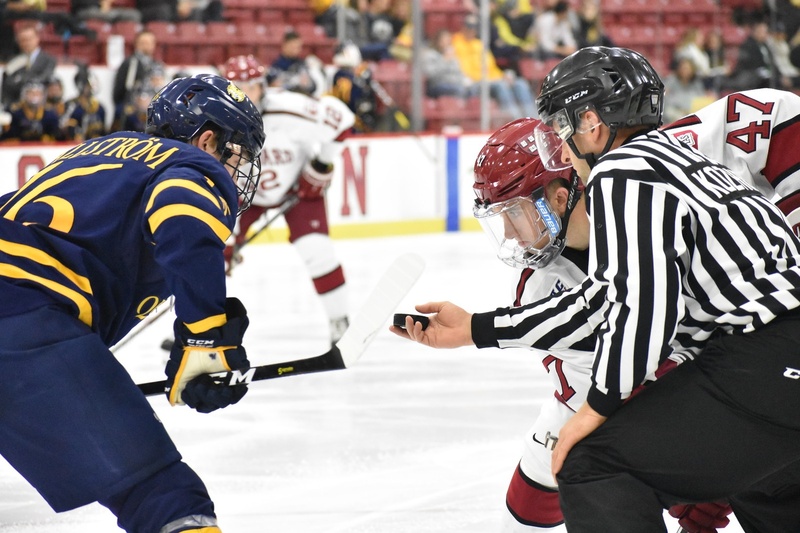 Harvard’s opening score put the visitors in the driver’s seat and provided a level of confidence that coach Donato’s group lacked in its first clash with Quinnipiac. The Bobcats, at that time the No. 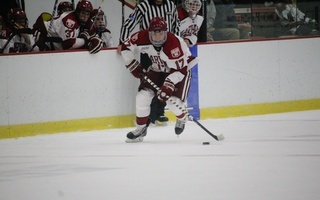 12 team in Division I, opened up a four-goal lead on the Crimson before the game was halfway finished back in November, making it difficult both mentally and physically for Harvard to compete. Despite the importance of Marino’s first-period strike, it was an empty-net goal from freshman forward Jack Drury that proved to be the game-winner. Shortridge thus allowed just a single puck to cross his goal line and, like Lackey, turned in a solid performance (1 GA, .962 SV%) in the blue paint. 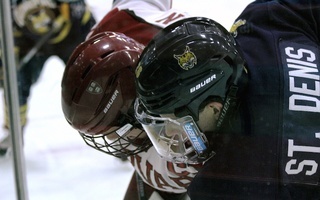 After the Bobcats skated past the Crimson in early November, Harvard outlasted a highly ranked Quinnipiac team on the back of sturdy goaltending. Notably, Harvard stifled Quinnipiac’s two most potent offensive options, captain defenseman Chase Priskie and sophomore forward Odeen Tufto. Priskie (13–14—27) is tied for fifth in NCAA scoring and leads all blue-liners outright in goals, goals per game, powerplay goals, and game-winning goals, among other categories; Tufto (11–18—29) sits fourth in scoring nationwide. Both players were absent from the score sheet on Saturday, due in large part to Lackey’s sensational outing. The Crimson cannot dwell on its winning effort for long, though. The team’s next game is an annual classic: an historic rivalry clash at Cornell’s Lynah Rink.